Some Hydrozoa, like the Branching Fire Coral, can give a very painful sting if touched! There are many animals in the class Hydrozoa, and they are quite numerous throughout the waters of the world. Hydrozoans number in the thousands but with vast differences within the class. Of these, there are only a few hydrocorals like the Fire Corals and Lace Corals that are found in the aquatic industry, along with some small short-lived hydroid polyps that may hitchhike in on invertebrates or plants. 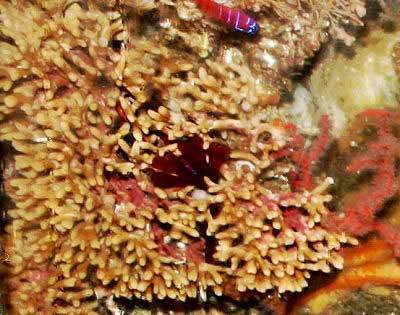 Hydrocorals are not true stony corals, but are a special kind of athecate hydroid. They are actually more like a very hard "soft" coral. Yet the Fire Corals are very similar in appearance and habitat to stony corals. They are also hermatypic, meaning they contribute to reef building, creating a hard skeleton from calcium absorbed from the water. The Lace Corals will also produce an aragonite and/or calcite skeleton but are mostly small, "lacy", and very delicate. The Hydrozoa (Hydrozoans) is a class of animals that belong to the phylum Cnidaria, along with corals and jellyfish. There are about 3500 known species in this class. They are very small predatory animals and can be solitary or colonial. The Hydrozoa have two principle forms; the predominant body type is the polyp and the other is bell-shaped or the shape of a thin disk. The life cycle of a hydrozoan is believed to originate as a sessile polyp. In this stage it multiplies asexually. Animals in the polyp stage are known as "hydroids". The polyp stage can then bud, forming a free-swimming, planktonic animal, like the jellyfish. In this stage they are known as "medusa" and can produce eggs or sperm. The systematic classification of members of the class Hydrozoa is highly complex. There have been several different inter-relationships proposed and revised since the later part of the 19th century. For a long time they were divided into a number of orders, based on their growth and reproduction. But more recently a consensus seems to be emerging, divided them into two subclasses, Leptolinae and Trachylinae. However, there is still much verification work to be done, so this may continue to change. All members of the class hydrozoa have a hydroid or polyp stage, but many species do not have the medusa stage. The hydroid phase is the simplest stage, a polyp and it is usually colonial. Young hydroids develop from buds or eggs. The polyp consists of a simple hollow tubular form that adheres to the substrate. It has a mouth like opening that serves to both take in food and expel waste. The mouth is surrounded by extensions of the body wall, forming the tentacles. Colonies are formed with individual hydroids branching off from a common tube. On some specimens, like the Fire Corals in the Millepora genus, the mouths look like small pores dotting the surface of a colony, these are called gastropores. The gastropores contain two polyps within whose tips rarely extend beyond the surface. These polyps are the gastrozooids, which are the feeding/digesting polyps, and the dactylozooids, which are the prey gatherers. The dactylozooids are tiny hair like extensions that give these corals an almost fuzzy appearance, and they are also what cause a burn or sting if handled. The best-known hydroids, popularly introduced in beginning biology classes, are small, solitary freshwater polyps, the hydras in the genus Hydra. The medusa stage is formed when hydroid polyps bud off and form a free-swimming, planktonic complement to the sessile polyps. The medusa stage varies in form from bell-shaped to the shape of a thin disk. In the medusa stage they can still be described as short broad polyps, but with the mesoglea transformed into a gelatinous swimming body, like the jellyfish. Many hydrozoans are colonial, and most of these have both the polyp stage and a medusa stage in their life cycle. In the "hydroid" stage each colony has a base, a stalk, and one or more polyps. The colonies consist of a number of specialized polyps, known as "zooids". Zooids have independent movement within the organism but are not fully independent animals. These polyps have specific purposes including feeding, reproduction, and protection. Hydroid colonies usually have separate sexes, consisting of either male or female members. Thus each colony can produce only one type of gamete, either eggs or sperm. There is not usually both sexes in the same colony. For those colonies that have a medusa stage, this is the sexually reproductive phase of the life cycle. The reproductive polyps bud off asexually from the hydroid, producing tiny medusae that are either male or female. They are known as "hydromedusae". These mature and spawn, releasing gametes into the water column. The gametes join to become zygotes, which then develop into free-swimming larvae. Depending on the species, the larvae either settle onto the substrate and develop into a polyp, or develop into another medusae or polyp directly in the water column. The life span of the hydromedusae, again depending on the species, can be just a few hours or they can live in the plankton for months; feeding, growing, and continuously spawning. The "lace corals" are a colonial hydroid, and form small delicate branched "lacy" colonies. The "fire corals" are also colonial hydroids. They differ from the Lace Corals in that they will form massive colonies that closely resemble true corals in appearance and in a reef-building function. Some hydrozoans also developed colonies that are pelagic, or floating. These colonies are a cluster of individuals, having a variety of specialized functions for the different polyps. Good examples are the so-called "Portuguese man-o' war" from the Physalia genera and the Blue Button, Porpita porpita that can sometimes be found washed up on the beach. They can be mistaken for jellyfish, but the jellyfish is just a single individual. Most genera within the class Hydrozoa live in saltwater, but there are a few freshwater genera. A well-known hydroid that lives in freshwater is the genus Hydra. The small tubular Hydra is a solitary freshwater hydrozoan polyp. The Hydra may actually be the best-known hydrozoan, and is familiar to most students as part of the introduction to biology, but may not be the best example of this class as does not represent the full complexity of this animal group. The Hydra spends its entire life in the polyp stage, and never goes through a medusoid stage. Jellyfish are related to the hydrocorals, but because they have several different morphologies they are included in several different Cnidarian classes. About 1000 to 1500 genera are included in the class, Hydrozoa. Other classes the jellyfish are represented in are Scyphozoa with over 200 species, Staurozoa with about 50 species, and Cubozoa with about 20 species.